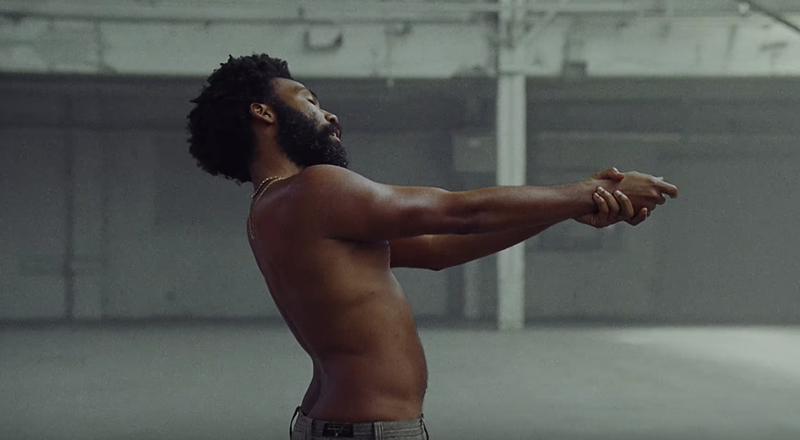 Childish Gambino’s new music video for “This Is America” begins with a black, bearded man walking to a chair to play guitar, while a shirtless Donald Glover stands dancing in the background. Moments later, the man in the chair has a bag and rope tied around his head, and Glover heartlessly shoots him in the head - setting off the most talked about music video of the year. Actor Calvin C. Winbush II missed watching a historic Beyonce performance at Coachella to portray his pivotal role in the video, but it looks like he’ll be able to be a part of history himself. Winbush played saxophone, piano, guitar, bass and drums while growing up in Detroit, and moved to New York City to pursue his music career after graduating from Michigan State University. He later took a free acting class and began booking gigs. He has since appeared in music videos by Wale (“Diary”) and Pharrell (“Freedom”) and the Oscar-winning film Whiplash, while his songwriting has landed him in studios with Akon and K. Michelle. He’s now a working actor in Los Angeles who runs his own voiceover coaching service, and is preparing to release his own first single as an artist. “I’ve done stand-up, acting, and music. So being able to work with someone who does all the stuff I do on a higher level is definitely something I was looking forward to,” he said. Winbush II spoke to REVOLT TV about shooting the video for “This Is America” in South Cental Los Angeles, his personal takeaways from the provocative piece, being mistaken for Trayvon Martin’s dad, and why he says Donald Glover is a genius. One of my agents deals specifically with music-related things. The producers needed somebody to do the guitar part who was actually able to play, because the melody that’s in the beginning with the guitar is an African melody and whatnot. One of the things I want to give credit to to their camp, they were very sensitive to the fact that, “we’re going to make it seem like someone put a bag and rope around your neck, and shoot you in the head.” They were overly caring about that fact. One of the producers, Jason Cole, personally called and chatted with me about it. It wasn’t just one of those things where - and this has happened to me before with certain things - you get to the set, and they just let you know what’s going on at the set. So it’s harder for you to back out. I let them know, “I really appreciate you guys going the extra mile to let me know what the video was about, what it was going to look like, and why.” Actually, it was a lot less dramatic than what I thought I was going to see when I got on set. What was this conversation with the producer like? At that point I wasn’t the one selected, but they were talking to [candidates] to let them know. “We’re doing an artistic interpretation of a song Donald Glover has. One of the scenes requires you to be able to play a certain style.” Most things, I can either do absolutely perfect, or I can fake it for the purposes of camera. For what they had going, I could actually play that. Then they let me know the subject matter and what my character would be doing, and what would be displayed. The person who falls down is a stuntman, but it’s going to look like it’s me. “Are you comfortable with that imagery?” I had questions about why. While he couldn’t give me the full explanation necessarily, it was shedding light on how desensitized we are to gun violence in America. When you watch the video, there’s so many things going on and so many things that you can take out of it, which I really appreciate. It’s multilayered, from everything to the dance movements, to the children, to the gun violence, to the things going on in the background, to the words in the lyrics and the music. There’s a lot of different layers. I wouldn’t be doing it justice if I said, ‘here’s my elevator speech wrap-up of everything that’s going on.’ I let them know, I usually don’t do a lot of explicit violent scenes unless it’s a film, in which case there’s a full story being displayed. I don’t like gratuitous violence, especially in music videos, because a lot of times you don’t get the story, you just get the violence so it seems to justify it. But I’m familiar with Donald’s work, with his standup, and his music, and he’s built up a certain amount of artistic trust with me that I would give him the benefit of the doubt. SZA also appears in that last shot as well, sitting on top of the car. Did you get to speak to her? That was actually the first scene we shot. SZA was was amazing, I got to chat with her and tell her how I appreciated the Black Panther song and how I was happy for her. She had just performed at Coachella, so I was able to congratulate her on that. Very sweet girl. I think it was supposed to be like an easter egg. If you see the scene and look at the girl, you can tell it’s her. And if you go to SZA’s Instagram page, she’s posting pictures from the set. But until I got to the set, I didn’t know she would be there. What did you personally get from the video? I won’t try to imply what was meant, I’ll just say what I took from it. The reason I was okay doing it was when different black people get shot, as much as I want to divorce myself from that, my other brain knows there can be consequences for holding the phone or breathing. God forbid, if anything happens, will my character be maligned? What would my friends say about it? It has been a passing thought when I see Philando Castile and a laundry list of other people getting shot down with no consequences for it. I’ve de-escalated things with police before, but what if I have an off day? As much as I don’t like any imagery like that, especially of myself, because I’m very conscious of the energy I put out there, I almost want people to see that. You can try to paint me as some thug or whatever you want, but my life shows I want to be successful in life. It’s nice to be able to sit back in my comfort in Los Angeles with the nice weather like this doesn’t affect me, but it does. They’ll say, ‘it just happens to people who pop off at the police,’ but look at Starbucks. I have a lot of white friends, and not that I have sympathy, but I can empathize. Imagine growing up and hearing about the Boogie Man all your life. Then one day, you’re slowly starting to realize, you are the Boogie Man, and you’ve done things to other people. That’s kind of a hard pill to swallow. “Not only is there racial bias that I consciously or unconsciously benefit from, but I’m also a participant in it.” I’ll hear people say “I’m not racist.” I’m like hold up. I’m black in America, I have black family and friends and I’ve been to a lot of cookouts, and I know black people and love black people, and [even] I have racial bias. You are not escaping, trust me. As shocking as the imagery was, I was hoping it wasn’t going to be shocking for shock’s sake. I was hoping it was going to make people think, but then also hopefully inspire people to think about ways to change. I think it’s doing that, and I’m happy to be a part of it. When reality is uncomfortable, it’s not going to change by pushing things under the carpet. 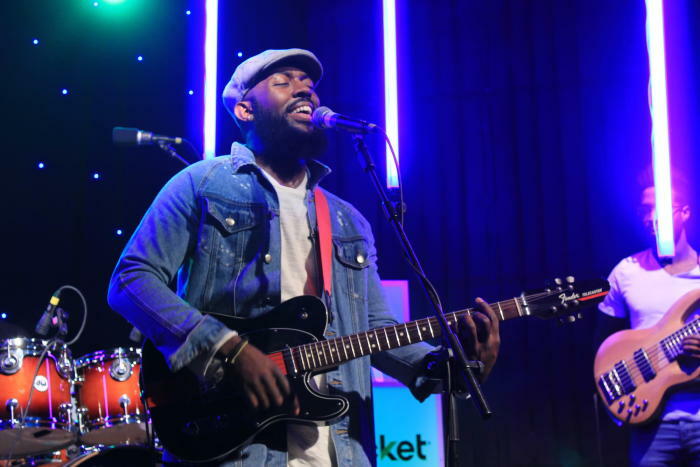 Actor/musician Calvin C. Winbush II, performing with his band. Do you have any thoughts about the fact that they actually brought your character back from the dead at the end of the video? For me, that just signifies hope. That even in times when there is loss, that doesn’t have to be how the story ends. There can be happiness. But you notice, I still have the bag on my head. To me, that signifies there are real things, and there’s a real history there, but it doesn’t have to stop there. You don’t have to lie and say everything was all good, but we also don’t have to say that we’ll always be what we currently are. Did you see people saying that the man in the video was Tracy Martin? It was weird. My homegirl told me, “there’s this chick saying you’re Trayvon’s dad in the video.” I thought it was one person. Then I went went to a couple of sites and they were actively saying it. I do see a resemblance, but it’s weird. When I tweeted a couple writers [to correct them], the entirety of black Twitter had my back. I don’t even know if Trayvon Martin’s dad can even watch stuff like that. I hope he doesn’t see it. He doesn’t need that kind of trauma. Without judging any of the news sources, I feel like news like that should be very much verified. For his sake, I apologize on behalf of anybody that spread it. Put some respect on that man’s name and his son’s name. With his name, there should be a certain amount of respect and journalistic integrity. How was Donald Glover on the set? He was amazing. I have so much respect for him, and I appreciate being a part of the process as a whole. Even when they were talking to me over the phone, I knew this was going to be big. “Redbone” was very successful, and he didn’t even have a music video for it. So this one here, they’re going to go for it. I don’t like to throw the word genius around too often, but it’s fair. He does things on a high level consistently that no one like him does. The way he thinks is very effective. I got to talk to him a little bit on set, and he gave me some amazing words of wisdom. But he’s a regular person. I was cracking jokes, and him and the director were busting out. I think the impression is maybe that he’s walking on the clouds, or he’s on some weird stuff just because he thinks outside of the box. But I’ve been on too many sets with people of different levels of fame. Only thing I want to do on set is make sure I’m being respectful of his process if I can tell he’s trying to figure things out. He’s there as as entertainer, but he’s also working with the production and the director on a higher level than the average artist would be. I’m glad I got to talk to him on the set and everything and see how he was, and hopefully I get to work with him again in the future.